We have always been admirers here at Addicted Art Gallery of artists who deftly combine more traditional fine art with a characteristic 'street art' style, of which there couldn't be many finer examples than the two luminaries of Walthamstow, London collectively known as STATIC. To you and me, they're Tom Jackson and Craig Evans, natives of the North East of England who first met at art college, went their separate ways - completing Bachelor of Arts degrees in Edinburgh and Liverpool - and then finally reunited to start creating the dynamic, graphical and patterned work that has rapidly captured the attention of the capital's more enlightened art collectors. Jackson and Evans have now been working together for a decade under the STATIC banner, drawing upon screen printing and mixed media techniques that they first encountered during their respective university degrees, but have since refined through progressive artistic experimentation. STATIC aren't merely engaged with the highly distinctive aesthetic blend of traditional fine art and edgier 'urban art' techniques for their own sake, even if those techniques are extremely varied. They encompass everything from spray paint and stencils to screen printing and good old fashioned painted brush strokes, applied to wide-ranging surfaces such as wood, metal, glass and perspex. After all, what arguably really matters about any artist is what they have to say, and STATIC have already proved themselves pretty vocal on subjects such as pop culture, beauty, power, celebrity, belief, faith and identity. Whatever the exact reasons for STATIC's appeal - their lack of shyness in tackling all manner of aspects of public life, or simply the visceral pleasure of the paint and stencil - it is a formula that is gathering plenty of fans, judging by the frequent disappearance of so many of STATIC's pieces posted around London. Nor is that a state of affairs that STATIC themselves seem displeased with, declaring in an interview with the online magazine Don't Panic in 2010 that, "the pieces we put up in the street are in the public domain, we don't expect them to be there forever and don't mind that they often disappear within hours of us dropping them." So, what are the works that have won STATIC their fame? 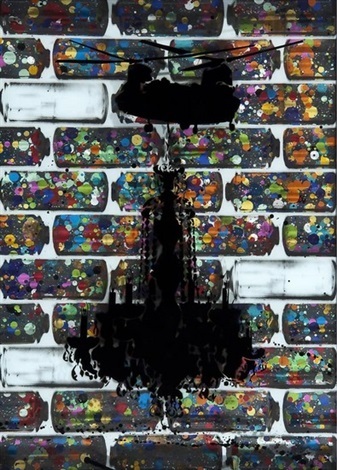 STATIC's most memorable images are arguably those that have best summed up their humorous, satirical approach to public and political events - such as Chinook Chandelier, which referenced the £500 million purchase by the Military of Defence of eight useless Mk3 Chinook helicopters. Another widely admired image was Anarchy, its depiction of Scarlett Johansson armed with a leather Luxury Vandals branded aerosol can earning more than double the anticipated sales price at the Dreweatts Urban Contemporary Art Auction - and there have been many similar stories since, not least as the duo has gradually built up a portfolio of high-profile exhibitions. Among those exhibitions was their first ever solo show, New Ways of Seeing, which opened at artrepublic, Soho in May 2010. 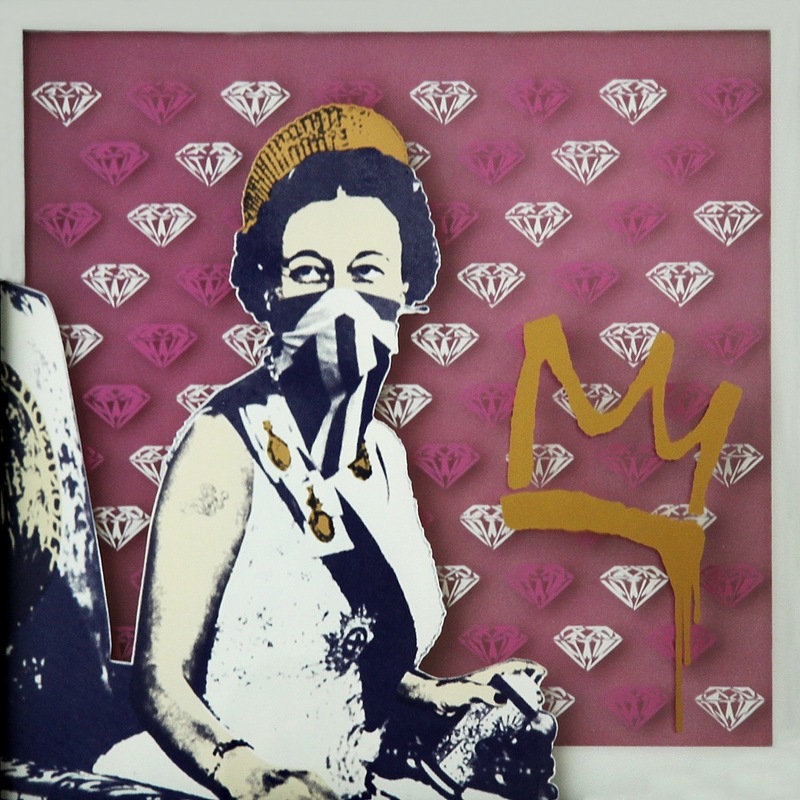 It was based around two themes, with 'The Luxury Vandals' collection concerning the desirability and commercialism of street art within the consumer market, and the 'Fight for the Right' series addressing what Don't Panic described as "the external struggle to be seen and heard when confronted with social, political and economic injustice". STATIC followed up their solo exhibition in London with another in Japan, and in the period since 2010, have continued to exhibit both on the streets of the English capital and in gallery spaces across the world. There has been a particular focus during this time on the creation of layered glass works and their subsequent display in the UK, Japan, the US, Russia, India, Italy and our very own Singapore. All the while, the accolades have continued to come STATIC's way, with several of the pieces from their 'Phantasms of the Living' show being added to the Saudi Arabian Royal Family's art collection in 2013, followed the next year by Activision commissioning them to produce a unique Camo pattern for the release of Call of Duty: Advanced Warfare. Is there a quote from either of STATIC's protagonists that we could leave you with to, in some way, summarise their subversive approach to their art? Well, we probably couldn't do much better than Evans' remark that, "mediocrity, virtual reality and the rapidly diminishing attention span of the human race" are the greatest threats to the modern art world - sentiments with which we have to at least partially agree.